To replace a toilet, you don't need a professional license in plumbing, only basic tools, patience, and a few hours of free time. There are many reasons to replace a toilet. Maybe it’s old or avocado green. Or maybe it rocks more than the Red Hot Chili Peppers when you sit on it. Or perhaps it uses more gallons per flush than the amount of water Survivor contestants get in an entire season. Fortunately, replacing a toilet is one of the easiest DIY projects there is. With patience, a few simple tools, and a little strength, you can install a gleaming new water-efficient commode within only a few hours. Before removing your old toilet, don’t forget to measure it. Specifically, mark down the distance from the wall to the center of the bolts that attach the base to the floor. Is that distance 12 inches? You’re in luck. Your toilet is standard-sized. If you’ve measured a distance other than 12 inches, you might need to custom-order your replacement toilet. To avoid ordering one that is too large, also measure the space you have available to accommodate the width of your new fixture. Beneath the tank of your existing toilet is the water supply line. Adjust its knob to stop the flow of water to the tank, then flush. Most likely, there will still be some water left in the bowl, so don your rubber gloves and use either a small cup (to bail it out) or some old towels (to soak it all up). The easiest way to get your old toilet out of the bathroom is in two stages. Start with the tank and finish with the bowl. To separate the tank from the bowl, unscrew the bolts that attach the two pieces, then lift the tank off and carry it away, or set it aside on some old towels or a panel of cardboard. To remove the bowl, pop off the caps that cover the closet bolts (the ones that go into the floor). Next, unscrew the nuts from these bolts, rocking the bowl back and forth gently to break it free from the wax seal at its base. When the bowl feels loose, lift it off. A putty knife should remove the old wax seal from the flange under the bowl. Wipe everything clean and to prevent sewer gases from entering your home, stuff a rag in the drain hole (or cover it with duct tape-secured plastic). Assess the flange (the ring beneath the wax seal). If it’s in good shape, leave it alone. If it’s cracked, you might be able to patch the damaged area with a repair tab, available at your local home improvement center. 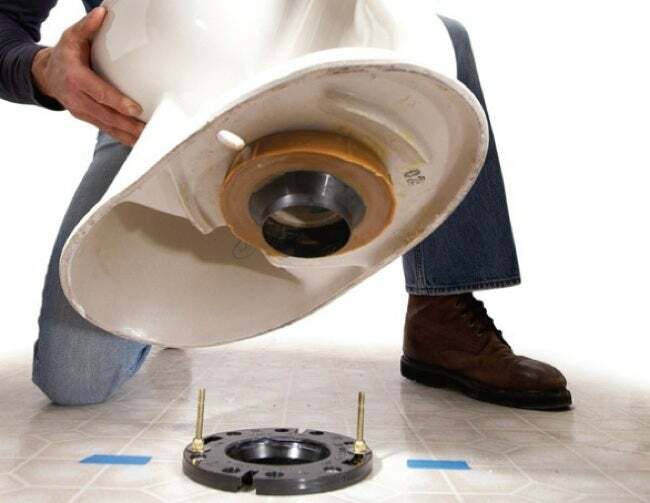 If the condition of the flange appears irreparable, arrange for a plumber to come and replace it. Installing the replacement toilet involves the same process as the above, only in reverse. First, place a new wax ring (one should come with your purchase) around the hole at the bottom of the toilet, known as the water horn. Make sure the tapered side of the seal is the one facing the toilet. Set the bowl onto the closet bolts. Hand-tighten the nuts back into place on the bolts, but make sure there is still plenty of play between the nuts and the toilet base. Rock the bowl back and forth to set the wax ring, then gradually tighten the bolts all the way, one side and then the other. Use a level to make sure the bowl is not sitting on a slant. If you’re a bit off, use shims to get it right before tightening the bolts one last time. 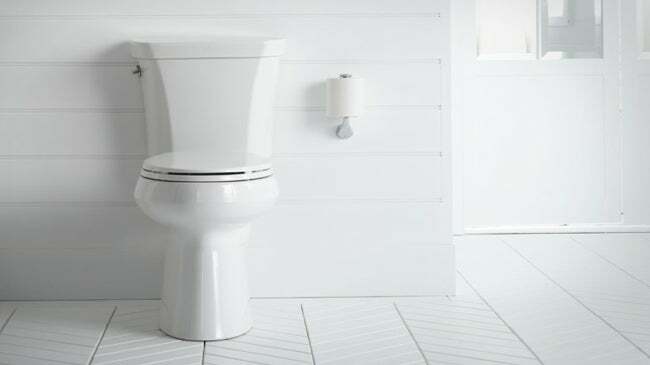 Be very careful not to over-tighten the bolts; toilet bowls have been known to crack during this stage of the process. 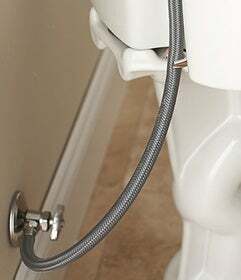 If your toilet came with a rubber gasket, place it on the bowl, setting the tank right on top. Make sure to line up the holes for the bolts that will join the bowl and the tank, then go ahead and tighten the nuts on these bolts. Finally, reattach the water supply line, put a thin line of silicone caulk around the toilet base, and turn the water back on. You’re all set!